given below for Loyola Academy Associate Professor/Associate Professor/Assistant Professor posts. For these jobs can apply from 28-03-2019 to 12-04-2019. More Information can refer the official website www.loyolaacademyugpg.ac.in. Remaining details like Salary, Important Dates, Available Vacancies, Qualification, College Address are maintained given below. 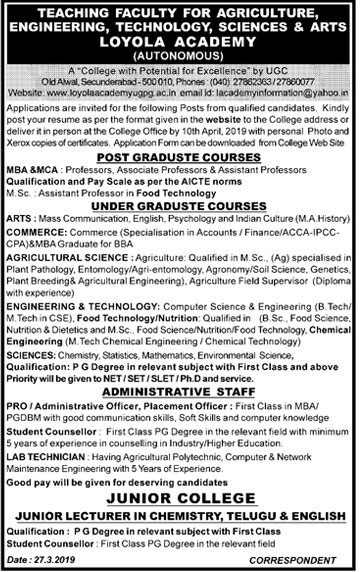 Starting Date to apply for Professor/Associate Professor/Assistant Professor Jobs: 28-03-2019. 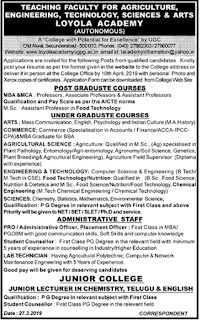 Ending Date to apply for Professor/Associate Professor/Assistant Professor Jobs: 10-04-2019. Old Alwal, Secunderabad – 500 010.